Spring garlic, or green garlic, is the immature garlic plant that has yet to develop a full-size head. Harvested for its sweet, aromatic, delicate flavor, the entire plant is edible and can be used in any preparation calling for garlic. The young tender stalk resembles a narrow leek or large green onion. The tender pale green stalks are great for infusing a sweet garlic flavor into soups, stocks, poaching liquids and broths. Spring garlic also blends well with other vegetables, makes great purees and sauces, and is a great addition to pasta fillings and risottos. 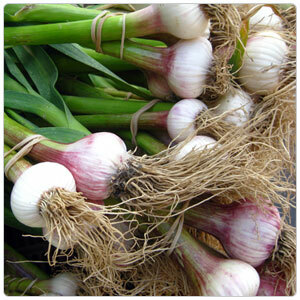 A single clove of garlic will produce a new plant. It can be harvested at any stage from younger tender leek-like stalks in the spring to full mature heads in the summer.